This 3 hour guided tour is the perfect Byron Bay experience. Join our passionate team of surf lifesavers for an unforgettable kayak to Australia’s most eastern point. The Byron Bay Marine Park is home to bottlenose dolphins, humpback whales and three species of sea turtle, so keep your eyes peeled for them as you glide along the clear blue ocean. Our knowledgeable guides will share stories of local history, aboriginal culture and marine biology, making this tour the perfect combination of education and adventure. 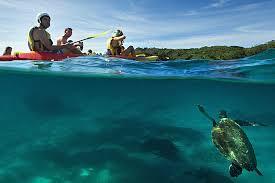 Oh, and prepare to save the best for last as your guide teaches you to surf your kayak back to shore!